The performer announces that he would like to perform the famous effect "blue poker" using three blue kings. It will only work if you have three blue cards. Suddenly and unexpectedly a fourth King appears. This king is discarded or tossed off stage. The performer now fans the cards to show exactly 3 Kings and now he can start the effect. But...once again suddenly and unexpectedly a fourth King appears visually and the performer just tosses it away in disgust! The cards have change color!!! He turns the cards around to show that he has three RED backed kings. He tosses them high into the air one at a time and walks off stage confused to huge laughs and applause!!!!! 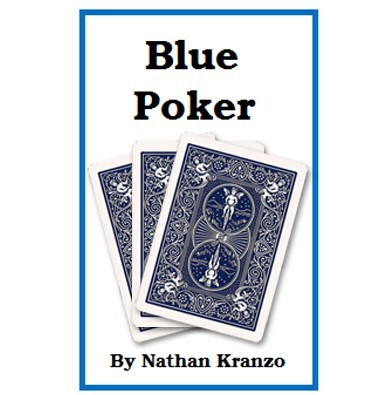 Blue Poker is a essentially one of the easiest and most entertaining card openers you will ever see! It can be done for one person or a theater full of people on stage. This is a standup self working handling of Tommy Tucker's six card repeat done with four cards that makes it much simpler and easier for the spectators to follow. So easy to follow that even a three-year-old would understand the effect and laugh at it. It has a funny and surprising ending that is quick and effective and resets in seconds. A fantastic opener for any card worker, close up magician or stand up/stage performer.